Aberdeen Dental is proud to have nurtured an environment where employees are more than that; they’re like family. Patients benefit from this relaxed approach. 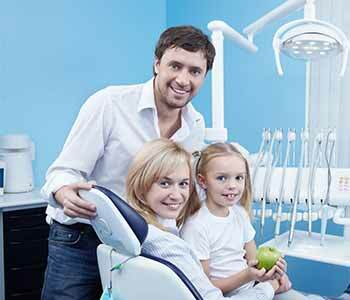 For a Family Dental Clinic Near Vernon BC, look no further than Drs. Pita Dhaliwal and Kevin O’Shea, and their extended family of professionals and generations of patients who seek oral health care built around their unique needs and preferences. 6-month visits are standard, and start at a very young age. The Canadian Dental Association recommends visits begin by no later than baby’s first birthday. Depending on your oral health history and needs for treatment, exams may be recommended more frequently. Exams usually follow cleanings by Aberdeen Dental’s skilled hygienists. Specially-designed instruments in the hands of trained professionals remove stubborn tartar that can’t be removed with brushing and flossing. This is also a great opportunity to ask questions about oral care. For example, it may be found that your flossing technique doesn’t thoroughly clean both sides of the tooth, leaving food particles behind. Or you may discover that brushing overlooked areas like your tongue, a breeding ground for decay-causing bacteria. Interdental brushes and other aids may be suggested to clean around hard-to-reach spaces, such as molars or under dental bridges. Suggestions evolve with you. The medications you take often cause dry mouth, a risk factor for decay. Specialised products keep xerostomia at bay. Don’t delay. The sooner you call (250) 800-2664 to schedule a visit, the earlier your concerns are addressed, avoiding the need for more costly and extensive restorative procedures.